Basic and advanced tracking for emails is crucial for any successful email strategy. Unfortunately, all too often the repertoire of tools an ESP is missing is advanced analytics functions. That is why it is critical to uncover the scenarios when you need to leverage 3rd party analytics to aid the effectiveness of your campaigns. Below I am going to break down 6 examples of when you should look for 3rd party analytic tools, and where! 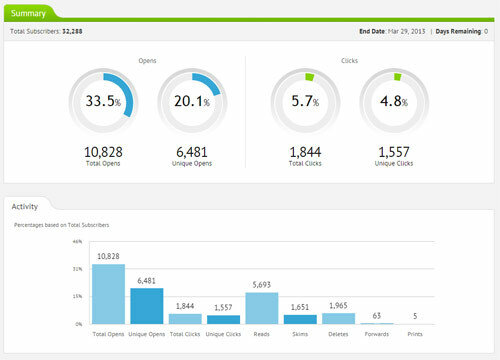 Sending email campaigns isn’t always done through ESPs chalk-full of nifty reporting tools and analytics. One of the more simplistic ways to send your email is by using an automated mail send system like PHPMailer. This is a bare-bones system as it delivers your mailings (hopefully) but does not offer any additional functionality and tracking behind these sends like opens or clicks. Same might be true for your emails sent from CMS or CRM systems. This type of email delivery system can be beneficial for small businesses because it is low cost and gets the sending job done. The use of sending through an automated mail send system is also seen frequently through transactional email. An example of transactional email would be seen when someone makes a purchase on your site and you need to send a receipt for their purchase via an Automated Mail Send System. While this may be an appropriate solution for your transactional email needs, this system offers no tracking to uncover what email strategies are working and which aren’t. This is when you need to seek help from a 3rd party in order to measure your success and refine your marketing efforts. In this case you can add a 3rd party tool like Email on Acid that can work with any mailing system. This third party tool can generate a campaign specific tracking code you can easily drop into the HTML of your email to measure your marketing success. They can offer advanced email analytics and reporting to track opens, clicks, forwards, prints, glances, as well as subscriber engagement, geographical location, email clients, click tracking, benchmarking diagnostics, and more. Email analytics can improve your bottom line. Tracking clicks within your email is absolutely crucial, however email clicks do not necessarily mean email conversions. That is why you need to track beyond the click and measure what occurs once the visitor has clicked through from your email to your website. 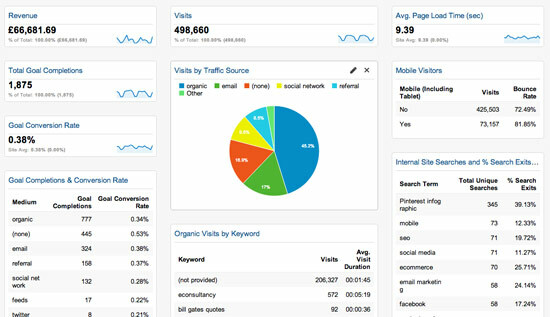 Tracking website visitors, where they are in the conversion process and automatically tagging email campaigns with analytics campaign tracking to target said visitors is a very tedious task to do on your own. That’s why you should seek out a third-party to help you automate this process. You don’t have to shell out extra cash on top of your ESP for this kind of tracking, though! With Google Analytics you can insert web tracking codes in your html to help you further understand how your recipients are responding to your email campaigns and how they are interacting with your website. With this tracking you can also isolate visitors referred from email to understand their preferences and behaviours. A simple tweak in your email campaign could significantly increase your bottom line; that’s why testing MUST be your #1 priority. A/B testing is a fantastic diagnostic tool to better understand visitor behaviors and priorities. That’s why it is important to use third-party analytics if your ESP does not offer easy email split testing. Not only is A/B testing incredibly effective in refining successful marketing elements, but it is also incredibly easy to set up simple A/B tests. For instance MovableInk or Pixylon could answer parts of that A/B testing challenge. They allow you to upload multiple image based creative variations, test them all and auto-select the winners. That means no more waiting around for weeks sorting through the data to find out which email campaign was the most engaging. Talk about putting your testing on autopilot! As digital marketers, we can no longer rely on JUST our intuition when deciding what will resonate with our audience. A/B testing can provide us with the hard facts and in-depth data we need for the best conversion optimization. Let’s face it, buying online is all the rage and that is why e-commerce storefronts are on almost every website. Email is one of the essential aspects of e-commerce, even if you are buying a tangible product. Think about it, when you enter your credit card info online and make a purchase, your immediate next step is looking in your inbox for a confirmation email and more details about the product you just purchased. That’s why it is sometimes needed to incorporate a 3rd party in your ESP to automate the necessary purchase follow up emails. Following up via email to your new customers not only gets the purchase in your customers hands (or gives them information for how to get access) but it can also be an opportunity to send targeted marketing campaigns as an upsell. By using e-commerce analytics, you can sell more by offering upsells and discounts based on costumer purchase amount, date, promo codes and more. For example a 3rd party integration tool, Postmaster, can link webstore info from Volusion or Bigcommerce into MailChimp. Then with ecommerce360, you can automate the sending of order details and follow up campaigns. Although not a third party analytics package, integrations are sometimes needed to make the analysis of email behavior on other data possible. A one-size-fits-all approach to email marketing doesn’t work when you are speaking to a diverse audience. The reality is that most businesses cater to more than one kind of consumer so you need to leverage personalization when sending out your email campaigns. When I am talking about personalization through email, I’m not just referring to using the recipient’s first name through merge tags. Instead, I’m talking about a 3rd party image rendering tool like Monetate that makes the “first name” level of personalization look like child’s play. An email personalization tool can make your emails more relevant to the subscriber by using dynamic content that is triggered when your subscriber opens the email – opposed to when the email campaign was sent. A marketer can break down all the segments and add dynamic content that you can incorporate to send the most relevant email at any given time. Does the Weather Influence Buying Behavior? Is this analytics? Yes and No. Mainly it will be the personalization you want to use it for, but it also analyses the influence of (external) conditions on the email and purchase behavior. Skymosity for instance has a specific weather analytics function to see how rain, snow, temperature can change your conversions. Email analytics can be ONLY one piece of your marketing puzzle when you need to analyze and track the success of a campaign. Sometimes you need to compare reports and metrics from multiple sources to get a visual representation and understanding of your data across the board, that’s where Tableau comes in. Tableau is a great software that allows you to see and understand your data from different analytic sources in an external stats dashboard. For example, you could blend email performance data with data from eCommerce, CRM, social media and web analytics. 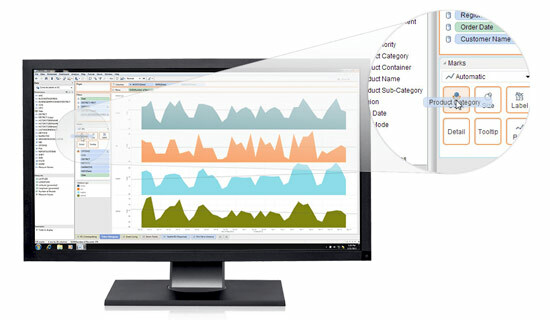 This dashboard could finally incorporate your “big data” into one succinct dashboard. No campaign or customer is an island onto itself. That is why you must decide what tools you need to track the appropriate metrics to measure your efforts. Hopefully the scenarios listed above have shed light on when you need to introduce 3rd party analytics to uncover your audience’s motivation and customer behavior. What do you think? Are there any scenarios we missed above when bringing in 3rd party software is a must? Share in the comments section below! Mallory Mongeon is a staff writer and lead marketer at Email on Acid. She has her hands in everything from blogging to the social media and email campaigns. If she's not tweeting dorky email jokes, she is talking incessantly about her dachshund, Schnapps (Yes folks, she named him that). Don't be shy, give her a friendly shout out on Twitter to talk about the latest email gossip.